The line of the rod is not attached to the rod when I cast it. On multiplayer, the client would see the bait as black. I wanted to put "0.12.1" but I won't actually let me not build 13 though. 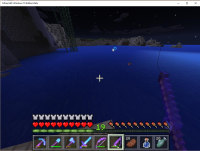 MCPE-12425 When changing your FOV, fishing line doesn't connect to bobber.